More wicked and treacherous spirits have been unleashed in the earth These spirits are responsible for strategically pouring out chalices of death and destruction upon the land. And these spirits are obsessed with taunting, harassing, and inciting war against the Chosen People of THE MOST HIGH This is evidenced by the plethora of calamities and natural disasters that we have sustained around the globe We have suffered traumatizing, formidable loss of life, a crumbling economy with record high unemployment, job loss and foreclosures, as well as inexplicable epidemics like H1N1 (Swine Flu). These demonic spirits are confident that we will not accept their summons to battle because they are confident that we are oblivious to the existence of and need for a spiritual war. And even if we are not oblivious to this reality, these disembodied spirits are confident that we are too ill-equipped and too afraid to engage in this war YAH (God) has not given us a spirit of fear, but of power, love and a sound mind. Oddly, Believers around the earth find themselves, equally, if not more fearful, acrimonious, and disempowered by what is transpiring in the world than those who prefer to live a life without YAHUSHUA HAMASHIACH* (Jesus, The Messiah) ?Yet, the Chosen of THE MOST HIGH must remember that no matter what is being unleashed in the earth, YAHUAH**(God) is in absolute control Indeed, He knows what will get our attention and He knows what will compel the scales to fall from our eyes He knows precisely how, when, and where to prick the hearts of His People Hence, He has permitted these trials and tribulations to provoke our hearts; He has even orchestrated some of these things to mobilize us into battle for the saving of many souls And He shall continually navigate us through such tumultuous times WARRING FOR THE LORD is the first book of three from the Kingdom Secrets and Mysteries Revealed Anthology. In this book, YAHUAH (God) speaks from His Heart to the hearts of His Chosen People. 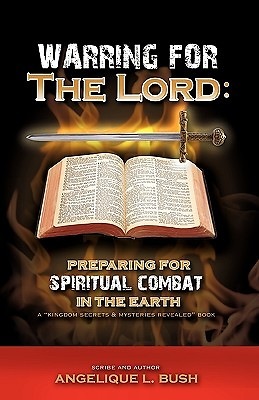 His Majesty urgently instructs, qualifies, and commissions The Body of HAMASHIACH for spiritual combat in the earth; and He equips us with His Strategy for combating the demonic powers and principalities that govern the earth. He reminds us that we must never lose perspective of our mandate in the spirit, despite the mayhem that may be catapulted into our lives, in the natural. For, we are to evangelize, proselytize, nurture, disciple and lead a harvest of lost and dying souls to YAHUSHUA S Throne. Most assuredly this mandate, rendered to us by THE MOST HIGH, shall not be denied WE RE COMING FOR THE SOULS *Hebraic Name for Jesus, The Messiah **Hebraic Name for The Most High Excerpt from Introduction"